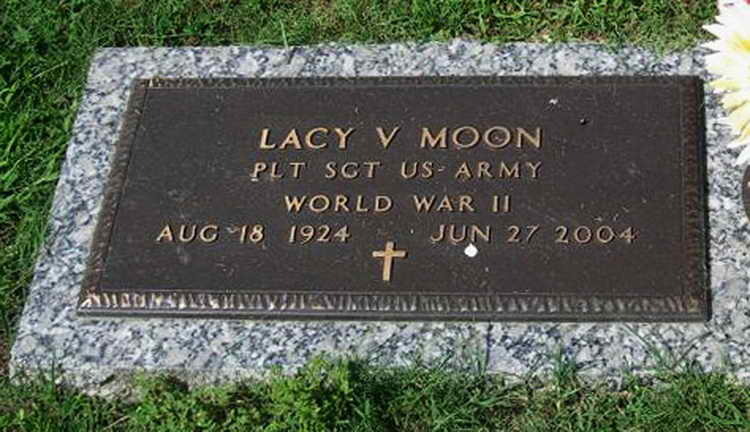 Lacy V. Moon, born Aug. 18, 1924, in Roxboro, N.C., a resident of Arlington, Texas, and a prior 30-year resident of Williamsburg, passed away Sunday, June 27, 2004. He served his country in the U.S. Army 82nd Airborne Division in WWII. He also coached Little League baseball for many years in Williamsburg. He is survived by his wife of 58 years, Maurine; a son, William V. "Van" Moon, wife Joyce, and his three children, Kelly, Lacy, and Colin, all of Williamsburg; a daughter, Allison Santoro and her two children, Regina and Vincent, of Arlington, Texas; a daughter, Shannon Fultz and husband, Monte, her two children, Chase and Peyton, of Colleyville, Texas; a brother, William L. Moon of Oxford, N.C. Four great-grandchildren and several nieces and nephews also survive.